For seven-year-old Rodrigo, who has a diagnosis of Asperger’s Syndrome, communication can be difficult. A playful approach tailored just for him is helping him embrace learning and find his voice, as our tutor Jose explains. Rodrigo reaches into a pile of tantalising objects and pulls them out one by one. The collection includes a purple cloth bird, smelling of lavender – which he sniffs. There’s a rubbery white mouse, whose tail gets a good pull. There are plastic feet, which can be slipped onto the fingers. When he spots the party horn – here standing in for a whistle – he gives it a loud toot and smiles. 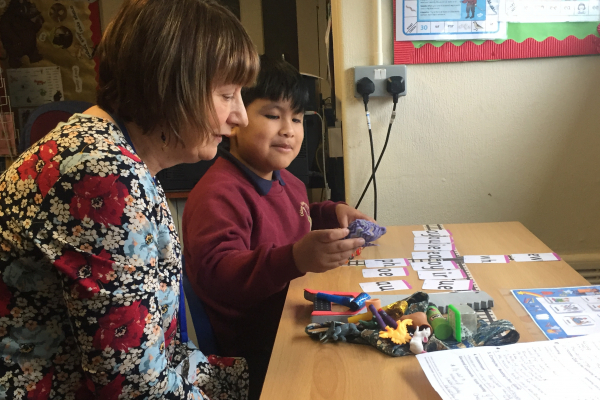 This exciting collection of multi-sensory objects has been selected by tutor Jose to engage Rodrigo and facilitate his learning of sounds. When he first came to our Literacy Lab in the middle of Year 1, this was something he struggled with. Today, with a little help, he places each object next to a corresponding card. The bird is matched with ‘ir’, the mouse goes with ‘ou‘, the feet go with ‘oe’ for ‘toes’, while the party horn goes next to the ‘wh’ for ‘whistle‘. 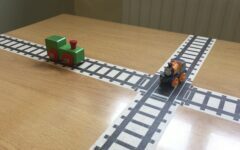 The trains and the train track can be handily incorporated into other activities. 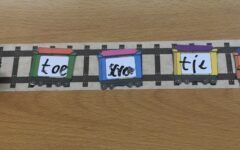 For example, to help him practise writing sounds – an area Rodrigo is still working on – Jose has laminated some cards that look like carriages with a space in the middle for writing. After writing the sounds, Rodrigo lines the carriages up along the train track strip. “If we’re focusing on a key sound, we often write it on the top of Green Train,” Jose explains. Another key area Rodrigo is working on is speech. “When he first came to the Literacy Lab, he wouldn’t talk at all,” says Jose. “During the session, I try to get as much language out of him as possible.” As a prompt, she produces a busy scene of a town. The previous day, Rodrigo and his class went on a trip to the Museum of London. Pointing out some of the details in the picture, Jose asks a series of questions to help him recall his experiences. “Did you go by car or on the train?” “Did you walk some of the way? What’s that in the road? 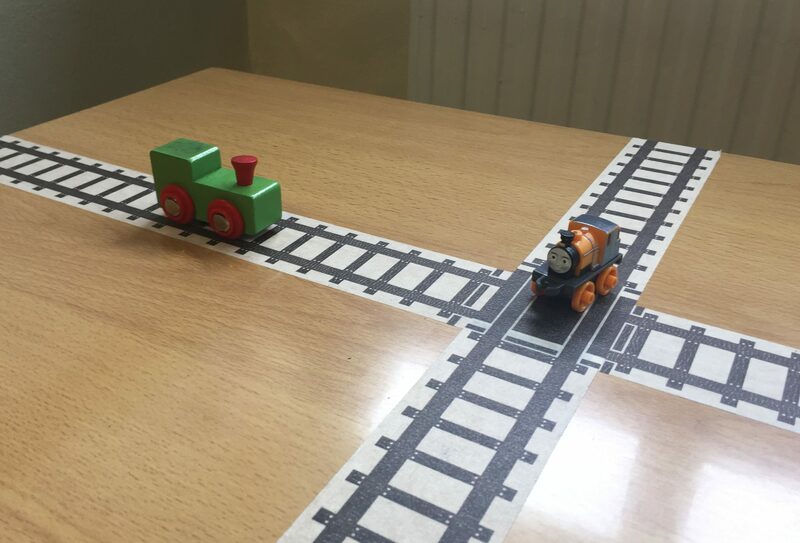 It’s a crossing. Did you use the crossing?” Today, Rodrigo gives shy, one-word answers, with little eye contact. 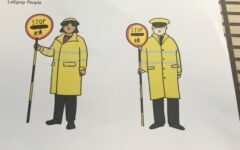 But considering his level of language when he first came to the Literacy Lab, this represents a huge level of progress. 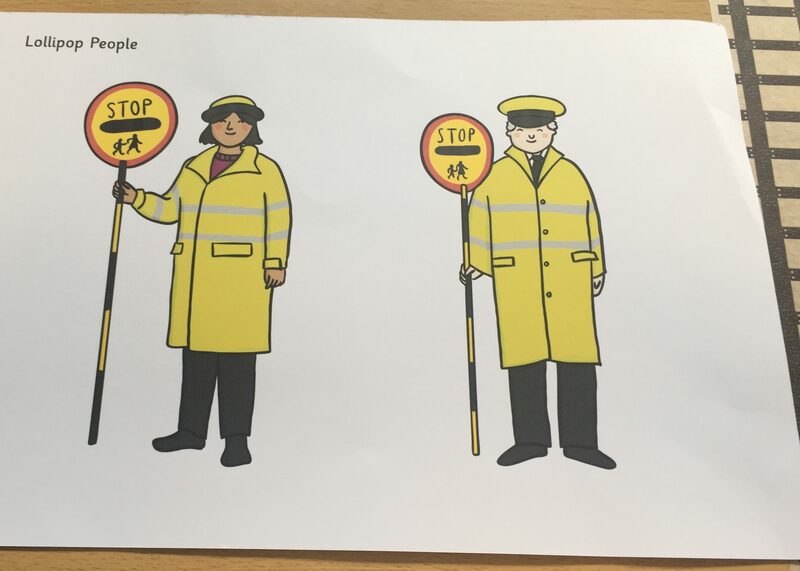 This activity leads into reading a comprehension text about a child whose mum is a lollipop lady, a term that Rodrigo appears unfamiliar with and that Jose explains with the aid a of a big picture. Rodrigo reads the text confidently, but when it comes to the comprehension questions he needs quite a bit of help to find the right answer. “When he’s reading a book, he finds it much easier as there are pictures to help, so this is quite a challenge for him,” says Jose. Find out more about our Literacy Labs. Green Train and Duncan help Rodrigo to feel at home. Train carriages for writing on. A visual support to aid comprehension.